Associated Press stories on the economy and the fiscal cliff during the previous week tell us that we're in for four more years of having the so-called "essential global news network" and the rest of the establishment press tell us that we aren't really seeing what we can see right in front of us. Meanwhile, their headlines and the stories they choose to ignore demonstrate a dogged determination to keep those who don't follow the news closely from seeing what they don't want them to see. 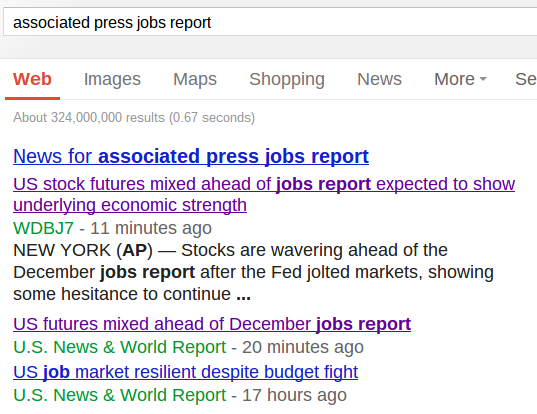 The AP's headline writers and Christopher Rugaber already had their minds made up about what last Friday's Employment Situation Summary from the Bureau of Labor Statistics would mean even before it was released. In a dispatch the previous evening headlined "U.S. job market resilient despite budget fight," Rugaber decided that the additional 155,000 jobs analysts predicted the report would show constituted proof that "the job market held up" during December's fiscal cliff negotiations between the White House and Congress. The AP brought out a deeper shovel the next morning just ahead of the report, claiming that it "was expected to show underlying strength." When BLS's number exactly matched consensus predictions, Rugaber and co-author Paul Wiseman wrote that it was in line with "the solid but unspectacular monthly pace of the past two years." Horse manure. The two-year average of 153,000 is just barely above the 150,000 jobs which need to be added every month just to keep up with population growth. What's "solid" about that? 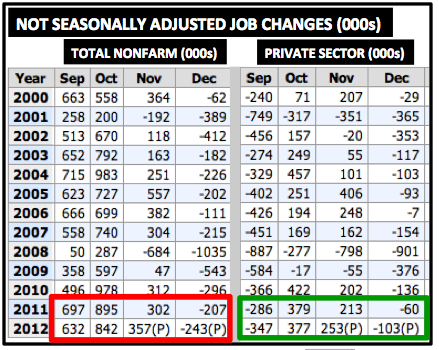 Note that both in total and in the private sector, the net change in jobs was worse than 2011 in three of the final four months of 2012. Additionally, December's contractions of 243,000 and 103,000, respectively, were worse than December 2005 and 2006 -- years during which the establishment media was mostly unimpressed with how the job market was performing. In a decent economy, the monthly jobs numbers would be beating the pants off of that period, simply because there's so much economic slack. The seasonally adjusted unemployment rates in December 2005 and December 2006 -- in the midst of that supposedly God-awful Bush economy -- were 4.9 percent and 4.4%, respectively. Monthly seasonally adjusted job additions of 150,000 or so are acceptable when unemployment is so low, and it turns out that the economy added a more than acceptable 2.5 million jobs in 2005, followed by 2 million in 2006.